APPROXIMATELY 6.73 million hectares of India’s agricultural land is affected by varying degrees of soil salinity. About 130 million hectares are under agriculture. “Estimates indicate that by 2025 the country may have an area of about 13 million hectares under salt-affected soils,” said Suresh K Chaudhari, a scientist in the soil and crop management division of Central Soil Salinity Research Institute (CSSRI) in Karnal. Unlike other soils, salinity of black cotton soils cannot be measured easily. Israeli scientists Eshel Bresler and David Russo had, in 1997, devised a method that measures the hydraulic conductivity of soils to gauge their salinity. Chaudhari’s team modified the Russo and Bresler method, as it came to be known, to suit Indian conditions. The method involves studying the effect of salinity on the rate of transmission of water in soil (hydraulic conductivity). Areas with low annual rainfall always tend to have saline soils. The salts present in the topmost soil layers are not washed away leading to a build-up of salinity over the years. An abundance of such salts destroys the physical structure of soil and clogs the soil pores. This adversely affects the movement of water in the soils and the roots of crops are unable to take water up efficiently. When salt concentration in soil increases over 40 me/l (milli equivalent/ litre), crops start showing stress symptoms like wilting. In the experiment, scientists collec - ted soil samples from Maharashtra and Chhattisgarh and analyzed their chemical composition. Then they checked the hydraulic conductivity of soil. The study was conducted over a period of five years in Bhubaneswar. The paper will soon be published in the Journal of Plant Nutrition and Soil Sciences. 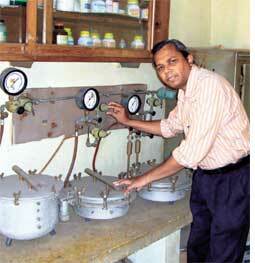 “The model helps in determining hydraulic conductivity and once this is known, we can find out how much salt we need to deal with so that plants have enough water to absorb and salt concentration of the soil remains below 40 me/L,” said Ravendra Singh, head of the agriculture physics department at the Indian Agricultural Research Institute and part of the research team. “Leaching, scrapping or growing selective plants which are either resistant to salinity or reduce the salt concentration of that area can help remediate the problem,” he added. Salinity-tolerant plants include trees like Eucalyptus, which absorb excess soil water and Casuarina that accumulate salts in their trunks. Rice, wheat and mustard are examples of crops, varieties of which CSSRI is working to improve upon.